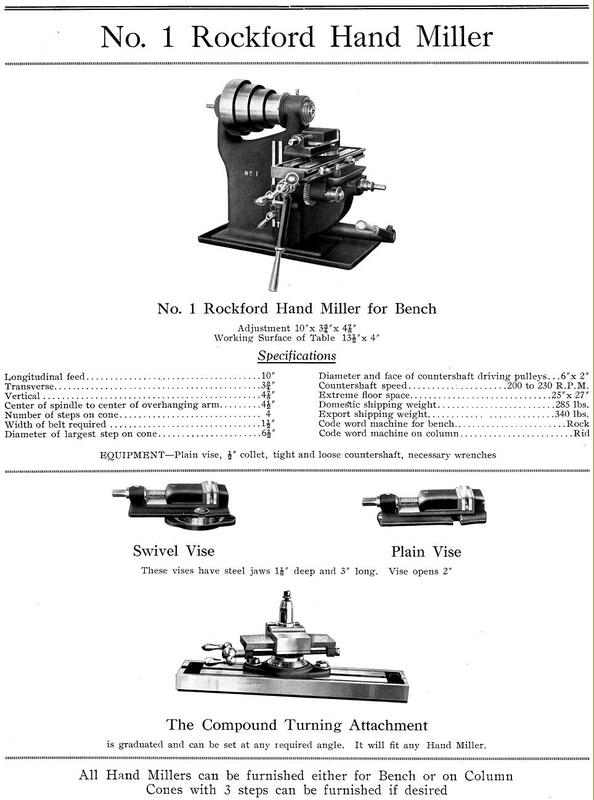 Rockford millers were made by the Rockford Milling Machine Company of Rockford, Illinois, USA. By the early 1900s the Company had merged with another to become the Sundstrand Machine Tool Company and for many years they made large horizontal milling machines, production bed mills, and ordinary and specialised lathes. During the 1930's they turned their attention to the development of hydraulically-powered, speed-control technology that evolved into the constant-speed drives used on almost all large aircraft for their electrical-power supply. Unfortunately, the company finally closed its doors in the early 1990s - yet, happily, the Sundstrand Aviation Company still exists (in 2001) as a division of United Technologies. Early machines manufactured included both simple hand-operated bench models and more ambitious floor-standing types of considerable size and complexity. A popular range, the "Hand Miller" type, consisted of three models: the No. 1, No. 2 and No. 3. A simple affair, without an overarm, the No. 1 was only capable of stub milling. The longitudinal feed, normally fitted with both screw and lever operation, was 10 inches, the traverse, by screw feed, 4 inches and the vertical travel of the 13.5" x 4" table 6.5 inches though a lever. All feeds were by hand - there being no power-feed option available. To exactly the same specification as the No. 1, the No. 2 miller was no bigger or heavier; however, it did have an overarm, allowing it to be used for proper horizontal milling. Based on the same body castings as the No. 1 and No. 2 millers, the No. 3 was offered with the option of a longer (18" x 4.25") power-feed table with an inch more travel than the standard 10 inches of the hand-feed version. The casting at the end of the overarm support was formed into a rotating flange on which could be mounted either a plain vertical head, or a slotting attachment. The attachments were often driven in an ingenious way - and one that was not always illustrated in the company's advertising literature - with the drive from the spindle lifted by gears so as to pass through a hollow overarm support. In comparison with bolting the vertical and slotting heads so as to be mounted concentric with the main spindle, this arrangement immediately improved the clearance beneath the cutter and allowed the construction of a large clamping area to improve the rigidity of the fixing. The spindle on all the smaller models was hardened and ground and ran in plain, cast-iron bearings - a ball race taking the spindle end thrust; larger models used tapered, bronze bearings. Rockford Millers and Catalogs Pages on Page 2.. The Rockford No. 3 Hand Miller with (above) the optional slotting attachment with stroke lengths from 1.25" to 2" and (left) fitted with the standard overarm. Arrangement of the drive to through the hollow overarm support to the optional vertical and slotting heads. The Rockford No. 3 miller fitted with the optional swivelling vertical head; a similar arrangement was used on the much larger No. 1 Plain Miller (shown further down the page). Rockford did not just make small bench and stand millers, their "No. 1 Horizontal Plain" of 1912 was a very strongly built machine which incorporated a number of carefully thought out features to assist the operator. With a working surface of 38" x 9" the table had 24" of movement horizontally (with automatic safety stops), 7.5" in traverse and 19" vertically. The 4 to 1 ratio backgeared main spindle with its B & S No. 10 taper, ran on adjustable, tapered bronze bearings (fitted with felt oil retainers) and was driven from a two-speed countershaft by a 2.5" wide flat belt acting on a 4-step pulley; this arrangement provided 16 speeds, normally from 22 to a rather slow maximum of 309 rpm. Well designed and, for its day, unusual in being neatly built and safely enclosed, the table power feed arrangement was by a chain that took the drive down from the inside of the main spindle though an enclosed channel to a 14-speed gearbox mounted inside the machine's main column. The box was built with steel gears held on shafts running in bronze bearings and could be operated whilst the machine was running; an external reversing box was fitted to the universally-joined, telescopic table feed shaft. The machine's distinguishing feature was the overarm arrangement; from the earliest days horizontal millers had been designed, or adapted, to accept vertical milling and slotting heads which plugged into, and were driven from, the horizontal spindle; unfortunately, this usually involved loosing a great deal of the machine's capacity - the distance from the table to the cutter being far too short. The Rockford miller overcame this problem in an ingenious way - the drive from the spindle was lifted by gears so as to pass through a hollow overarm support. This immediately improved the maximum thickness of the workpiece that could be held on the table and allowed the construction of a large clamping area to improve the rigidity of the fixing. With a little more thought, a set of interchangeable drive gears could also have been provided - and so doubled or even tripled the speed range..
From the earliest days horizontal millers had been designed, or adapted, to accept vertical milling and slotting heads which plugged into, and were driven from, the horizontal spindle; unfortunately, this usually involved loosing a great deal of the machine's capacity - the distance from the table to the cutter being far too short. The Rockford miller overcame this problem in an ingenious way - the drive from the spindle was lifted by gears so as to pass through a hollow overarm support. This immediately improved the maximum thickness of the workpiece that could be held on the table and allowed the construction of a large clamping area to improve the rigidity of the fixing. With a little more thought, a set of interchangeable drive gears could also have been provided - and so doubled or even tripled the speed range. The drive up to the hollow overarm support was of the simplest kind, involving three spur gears. The 360 degree swivel Slotting Head had a 7 inch throat and 4 rates of stroke between 2.5 and 3.5 inches per minute. The Vertical Head had a throat of 7 inches and a maximum distance between the No. 10 Brown & Sharpe nose and the table of 19 inches. The head could be swivelled through 360 degrees. Rockford No. 3 Miller with the Indexing and Dividing Head. The standard drum had six rings of holes giving indexing through the following ranges: 4, 24, 28 34, 40 and 60. The Rockford No. 2 Plain miller with a conventional overarm. The Rockford No. 1 plain miller fitted for simple stub milling with an unsupported cutter held in a collet at the end of the spindle. The Rockford Dividing and Indexing Head with 6 rings of holes in its indexing drum.